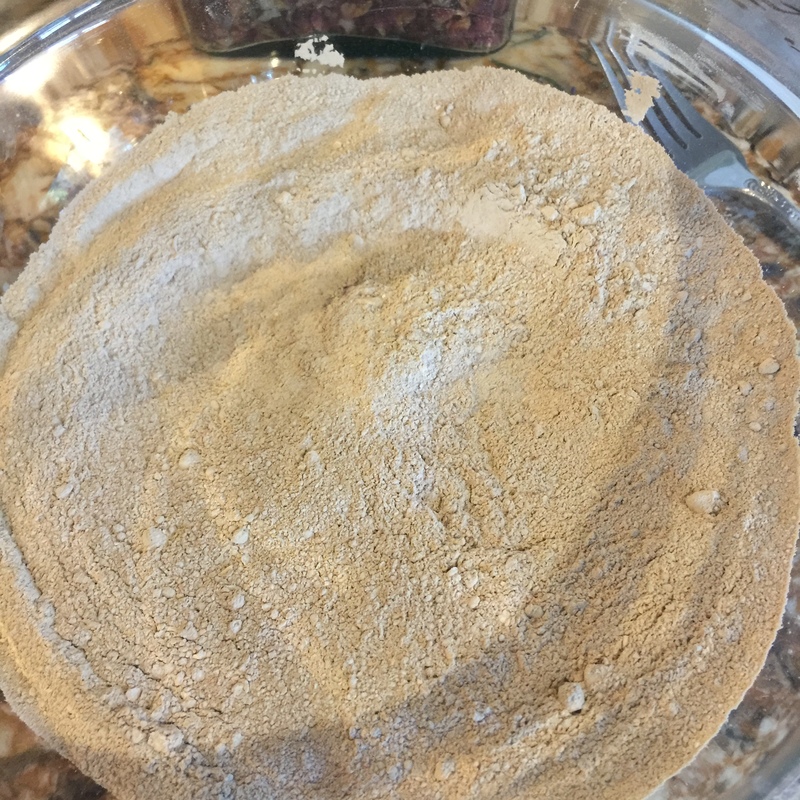 Would you like to be able to spend about 15 minutes to make 6-8 months worth of facial cleanser that is deeply cleansing, nourishing, great for sensitive skin, gently exfoliating, and leaves you feeling like you have left a fancy spa treatment? Well read on! I was not blessed with model perfect skin. It is sensitive and easily irritated rendering many cleansers down right damaging. Also different places on my face need different treatment. Under my eyes for example doesn’t need “deep cleansing” but my nose and chin do. This cleanser is not only gentle for all skin types; but, it can be adjusted by you to do more of what you need on the specific spot you need it just by adjusting the amount of honey/water/milk ratios. It can be adapted to any skin type from dry/mature to oily. Finally, there isn’t a chemical/preservative or unnatural ingredient anywhere in it– the needed ingredients are incredibly powerful and all natural. Historically, I have been a bit shall we say–indulgent– about trying a variety of spas; but, my skin has never felt as good as it does after using this cleanser. It is great to have the indulgence and pampering of a spa without the expense and in the comfort of home. If you would like to purchase this cleanser already made click here. For a personalized, custom blend created exclusively for your skin click here. You will need a coffee grinder. 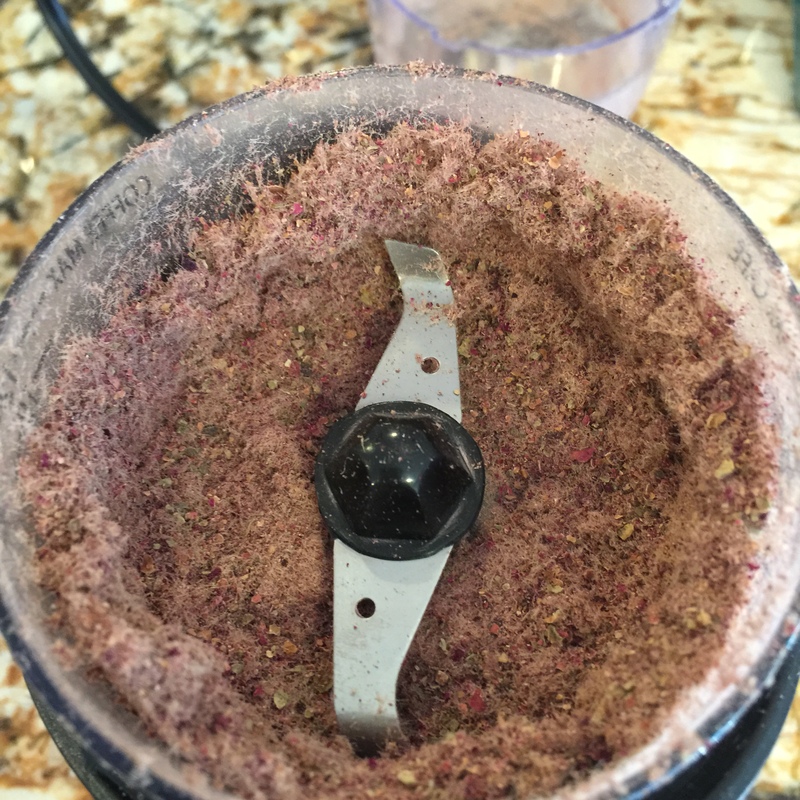 It is important to have one that is just for the purpose of grinding the ingredients for beauty or health creations as opposed to what you use for coffee. Unless, of course, you really like everything you make to smell of coffee. . . lol! 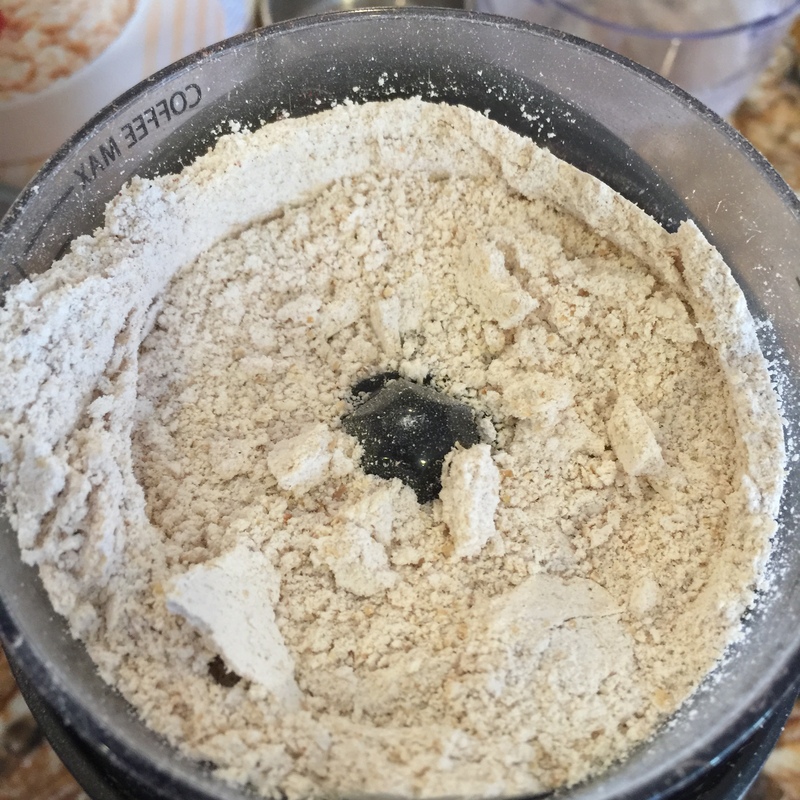 For all ingredients–measure once ground. As you can see in the above pictures the color changes after grinding. This isn’t a problem just something that naturally occurs. Additional notes about grinding. No matter how fine you grind there will be some “grit” due to the almonds, lavender, and roses. You probably won’t notice it until you use the cleanser; but, you will then. This is a good thing because that is how you get your exfoliation. You can choose to grind “less fine” if you like more grit. However, I recommend you try it first finely ground to see how your skin handles this before trying it in a more exfoliating form. 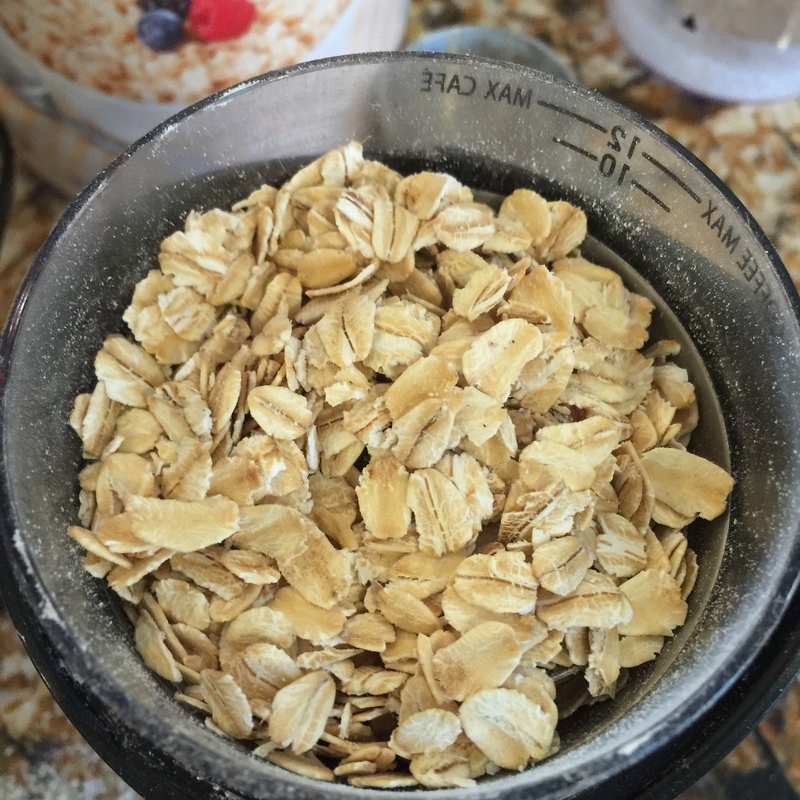 1 cup very finely ground oats–using your coffee grinder get them as fine as you can. 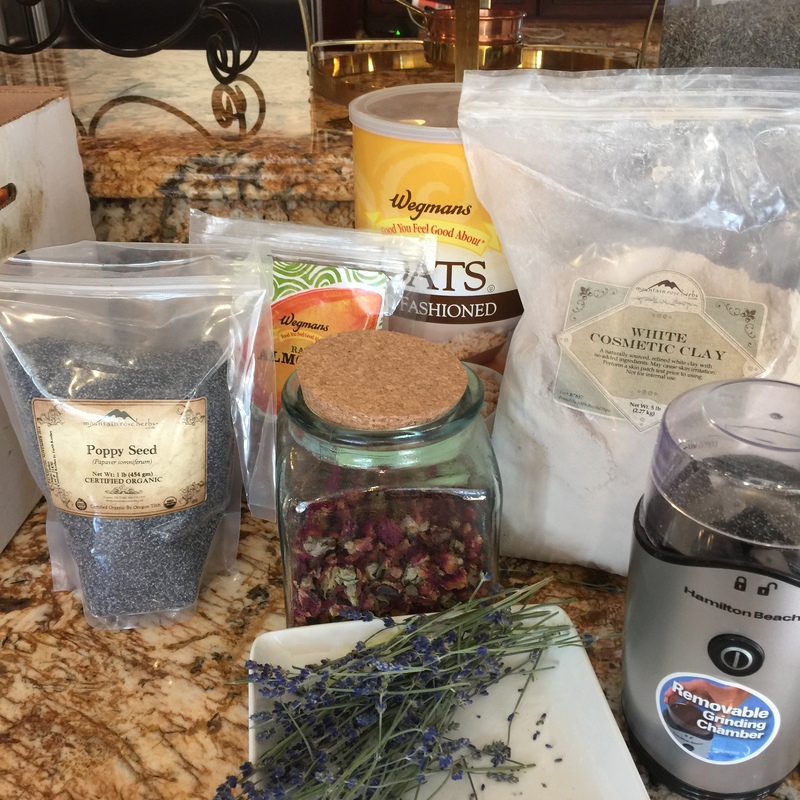 1/8 cup finely ground lavender– I use lavender from my garden that I have dried. You can do this as well–its really easy and a small plant can make enough lavender for a year of cleanser plus other products in the first year– or purchase from Mountain Rose Herbs. If you purchase I recommend getting English Lavender rather than Lavandin. Many people will use them interchangeably; but, I believe English Lavender is more potent and will produce a better product. The link above is to the English version; however, there is also Lavandin available should you wish to go that direction. 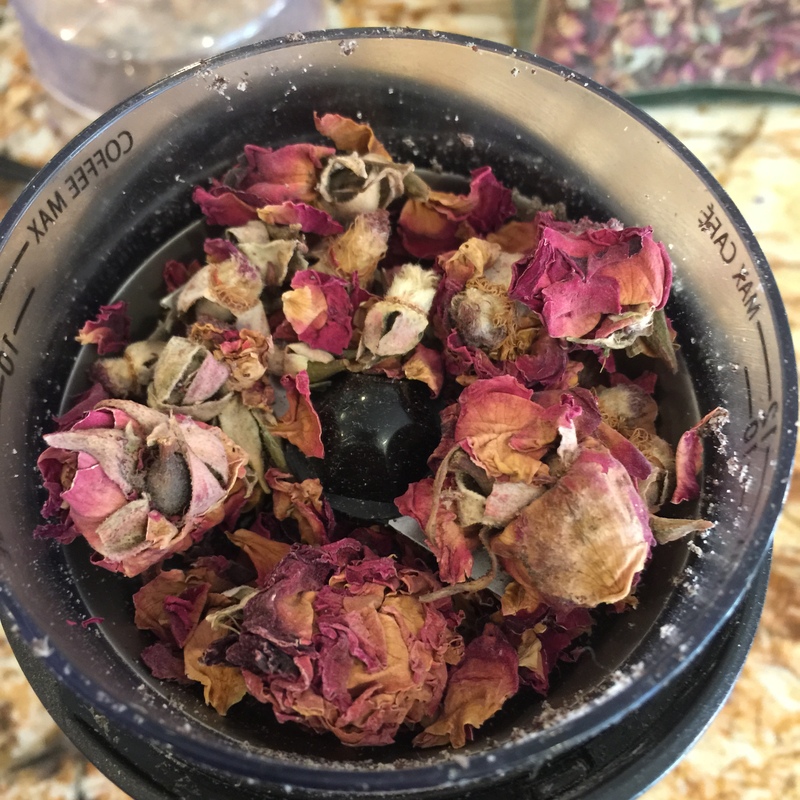 1/8 finely ground dried roses. essential oils of choice. I have used Bulgarian rose and lavender essential oils. Combine ground clay, oats, almonds, lavender, poppy seeds and roses in a glass bowl. Add a full dropper of essential oils of choice for scent or skin enhancing properties. Mix them in. I use a fork for this purpose. Store in a glass container by your sink will they will last–when dry like this–practically indefinitely. When ready to use you have options. (note: the first time you use massage very gently to see how much pressure works best for your skin). You can mix 1-2 teaspoons with water and stir into a paste. The thinner the paste the more drying it will be. If it is thicker it will be more moisturizing. Gently massage into your face and rinse with warm water. This is a fast and easy; but, I don’t like this as well as the next method. I will get a glass and mix 1-2 weeks of cleanser. This allows me to have cleanser ready to use rather than having mix each time. Any more than this and you risk spoilage. I take a few tablespoons of dry cleanser and a couple tablespoons of honey and about a half a teaspoon of water or rose water or milk. I usually just use water for convenience–but rose water or milk is a great treat. Mix. You will be surprised how this changes into an incredible cleanser. It isn’t sticky, smells delicious, and leaves my skin deeply cleansed yet moist. This cleanser can be used daily. 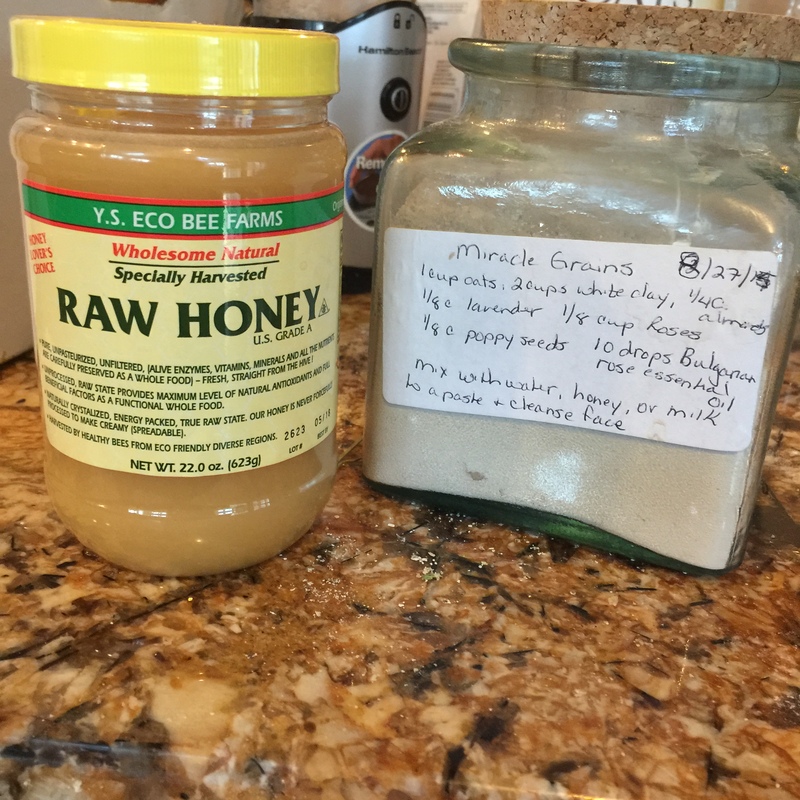 When mixing with honey the same principle applies that the thicker you make it the more moisturizing. The thinner–more drying. I have mixed some for my oily areas and different ratios for my dry- with excellent results. Finally, this formula makes an absolutely incredible mask. Simply mix a thicker paste, apply, lay back and relax/read/drink some tea or wine. . . .and after about 20 minutes or so rinse. If you only have 5-10 minutes it still works great but 20 is ideal. Please comment below and let me know how you like it!!! Enjoy! Sabrina, this looks like something I would enjoy trying. Our skin sounds similar and I’ve never found an exfoliant that doesn’t irritate or dry my skin. For my essential oils of choice, it’s a tough decision! But I think I’d go with Frankincense for it’s renowned anti-aging properties. It nourishes skin at a cellular level, and has a rich and relaxing scent. I like Sandalwood too, as it provides a touch of natural moisturizer to the mix and is such a powerhouse for beauty products. Can’t argue with your choice of Lavender too (and it is hands-down more beneficial than Lavandin, I agree). Stacey: That is incredibly generous of you! Your oils are very high quality; and, Frankincense is such a marvelous addition to any skincare product. It’s been revered for thousands of years for it’s powerful rejuvenation of the skin. How wonderful to be able to make a cleanser that also has anti-aging properties!! I also like geranium essential oil–which helps with broken capillaries, Neroli oil–which helps tone sagging skin, smooth lines and shrink pores without drying the skin, carrot seed oil which is amazing for regenerating cells/improving tone, and Ylang Ylang–which has one of my favorite scents–rich, spicy, and sultry–while improving elasticity and reducing fine lines. Hmmm. . .I may have to write a blog on all the options! We can really create the “perfect” skin care for each of us individually— in our own kitchens! This is a great offer. I am definitely interested. Hope I am not too late to respond. Hi Betty! Just email me at stacey.b.wynn@gmail.com and I’d be happy to send you one. Just need your mailing address! Great. =) A bit off tangent, but related: my son came screaming into the house two days ago from what he said was a wasp sting. Came out of nowhere.The homeopathic and clay pack (rhassoul, from Mt Rose) calmed him and took care of the pain.